Former Australian pacer Brett Lee is recognised for 310 wickets in 76 tests and 380 wickets in 221 one day matches. One of the fastest bowlers in the world, Brett is himself bowled over by pet love. Brett is widely acclaimed for his regular bowling speed of 150 km/h and above. His fastest delivery was 161.4 km/h. Soon, he would be seen in action at the upcoming IPL 2013. Here, Brett shares more about his pooch love. D&P: Describe your journey as a cricketer. Brett Lee: A lot of fun but also a lot of hard work. I love meeting people, challenging myself and representing my country. D&P: Tell us how the fastest bowler was bowled with the pet love. 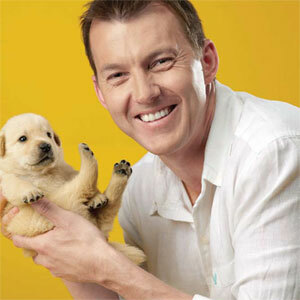 Brett Lee: I have always loved animals. Growing up a few hours out of Sydney, I have been able to have pets from a young age. My first pet was a bird I got when I was seven. I convinced dad to build me an aviary where I raised a number of birds over time. Pets take my mind off the hustle and bustle of everyday life. I am calm when I am with animals. In fact, I have been surrounded by animals all my life. I enjoy farm life and now own a farm in the Southern Highlands of NSW. I even had a dog but with all my travels for cricket, I realised it wasn’t fair on the dog. It quickly became clear that spending 300 days a year away from home is not fair on any pet. When you have love for a pet, you have to put his well-being first. So, I gave the pet to friends a few years back. I had to do what was right for my dog. I know when I finish up my cricket I will have a few more four-legged friends to look after! At that time, to and from the farm would be an ideal break for both me and my dog. D&P: What is your favourite pastime? Brett Lee: Spending time with kids and pets. Children love animals and watching kids playing with animals is a lovely experience. D&P: In your opinion, how is to be blessed with a pooch? Brett Lee: I think humans love animals because they are loyal. I think this is a great feeling and I am sure they have a bond just like we do. Dogs know when you are sad and stay by your side. They also know when you are happy! I think this is what makes ‘pet love’. D&P: Any funny/crazy antic you would like to share about your pet? Brett Lee: There is an Australian movie called Babe. It is about a pig who can talk to other animals. It was quite successful in both Australia and the US. I am credited as one of the ‘pig handlers’ in the movie credits!! I told you I grew up with animals. D&P: Any message you would like to give to your readers? Brett Lee: If you get a pet, treat him the way he should be treated. Feed him the appropriate food, not human food (as we don’t eat dog food!) but give him the right nutritional balance that comes from Pedigree. Spend time with him and treat him with ‘pet love’. D&P: The countdown for IPL 2013 has started. What can the cricket fans expect from IPL at large and Brett Lee in particular? Brett Lee: I am really looking forward to IPL. I love the Kolkata Knight Riders family and want to do well for all of them.